You almost certainly know that Siri can make phone calls from the iPhone with voice commands, but with new versions of iOS you have another great option; you can make calls that are automatically set to be on speaker mode. This Siri speakerphone call trick is particularly useful with “Hey Siri” voice activation, since you can make calls entirely hands free from iPhone, from the desk, in the car, or even from across the room if need be. This is a really easy trick to use that is incredibly convenient, just be sure your iPhone is updated to the latest version of iOS before attempting to use it. Of course your iPhone will need cell service as well, the rest is just knowing the proper commands to give to Siri. This works however you bring about Siri, whether it’s “Hey Siri”, raising the phone, the long Home button press, holding the Power button on an iPhone X, or even from an Apple Watch. For example, “call Mom on speakerphone” will call the contact ‘Mom’ and place the call on speaker mode automatically, without having to interact with the iPhone at all (and yes you should call your mother!). This works with all names, so “call David Letterman on speakerphone” would work too if you happen to have that contact information and phone number on your phone. If you have contacts with names that Siri does not recognize or pronounces in some discombobulated manner, recall that you can correct Siri pronunciation to greatly improve name recognition for features like this. 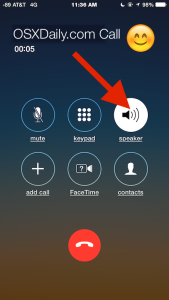 Once the call is placed, you’ll find the Speaker button is already highlighted and the call will go through the external output speakers rather than the ear speaker. This may seem like a small feature, but it’s very useful once you start using it. 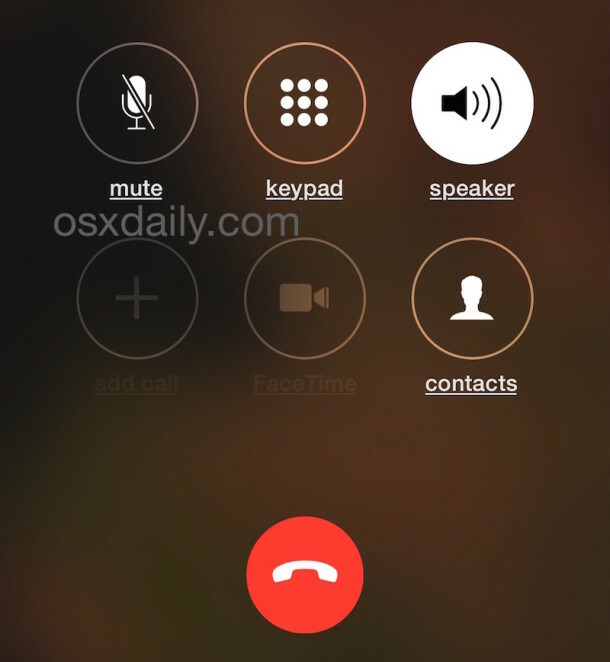 Previously, the only way to accomplish this was to adjust preferences to set all calls to default to Speaker phone mode, and then make a call with Siri, but that setting is quite literal in that every single call on the iPhone will default to speaker phone if the setting is enabled, which is not necessarily desirable for all users. Do this for mom, dad, sister etc… and if they have an iPhone number and a home number – then you just tell Siri, Siri call my son iPhone number, or Siri call my son at home number. If you don’t tell Siri a number when two are listed, she then asks which number she should call – telling her first saves time. But adding the ID to contacts make Siri more accurate first time try I have found. Yes I agree this is a good trick, identify the relationships in Siri for better results with Siri. Especially important with long names. Siri has weird pronunciation sometimes, will hear things you did not say. Keep it simple. Unless you’re referring to iOS 9, this does not work! She says she’s calling on speaker, but she doesn’t actually put the call on speaker phone. Works on iPhone perfectly. I use this in iOS 8 and iOS 9 all the time on my iPhones, Daniel. 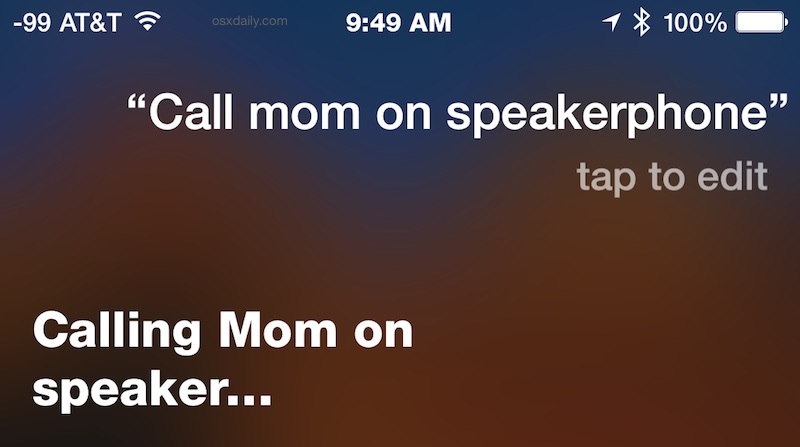 You should try again or let Siri make the call, it’s on speaker phone if you ask her to be on speakerphone. Not working for you but working for everyone else suggests the error lies with the user. I have an iPhone 5c and it has to be connected to charger for it to work? No the error doesn’t lie with the user, it lies in very poor code from Apple that won’t allow this to happen if the phone is on WiFi. To me it totally defeats the purpose anyway. The times I would use this most are when I’m sitting at a desk using WiFi. I thought the same thing for the last several weeks — say “Hey Siri, call Conference Bridge on Speakerphone” and she’d reply with “calling conference bridge on speaker”, and then start the call without speaker. So I’d jab the speakerphone button and curse Siri’s incompetence. But after reading this today, I tried it again (on WiFi), and decided to be more patient. Several seconds after it started the call, it switched to speaker. I think that Siri waits until the connection is established (maybe until it’s answered?) before turning on the speakerphone. Daniel is not lying. It happens to me too. I cannot find any help on the issue. But it does not automatically turn on speakerphone. The only way it works for me is if I have “Call Audio Routing” set to “Speaker”. It’s on “Automatic” as default. But if I have it set to “Speaker”, that means all calls our route to speakerphone, which I don’t want. Will it work without the mobile data and Charging mode? I just read the story of the woman who saved her baby’s life by calling ambulance using Siri on speaker, so I just tried it, and like others are reporting, it does not work. It says “calling emergency service on speaker” but does not select the speakerphone option. Anyone know why?